70150 Flaming Claws is a Legends of Chima set released in 2014. The speedorz included in this set is not the same design as the ones in the 2013 and Winter 2014 sets, like all the other 2014 summer speedorz sets. This is a description taken from LEGO.com. Please do not modify it. (visit this item's product page) Leap over the croc trap and avoid those Flaming Claws! 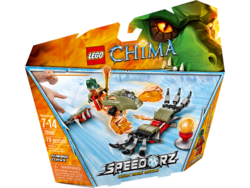 Make a leap for glory with Cragger in the LEGO® Legends of Chima™ Speedorz™ Flaming Claws game! Attach the Croc tribe leader onto his brand-new Speedor, pull the rip cord and unleash the power. Aim for the ramp, leap over the croc trap and knock over the CHI totem. Create defenses with the jump and trap then battle against your friends. 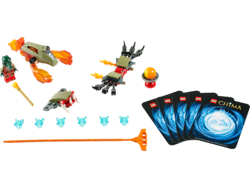 This set includes a Cragger minifigure, 2 weapons, new Speedor with fire claws, rip cord, fire CHI orb, CHI totem, jump, snapping croc trap, flaming claws with translucent flame elements, 6 CHI, and 5 game cards. Put your high-speed accuracy to the test with this rip cord skill game for 1 or more players. Facts about "70150 Flaming Claws"
This page was last edited on 12 January 2016, at 21:16.